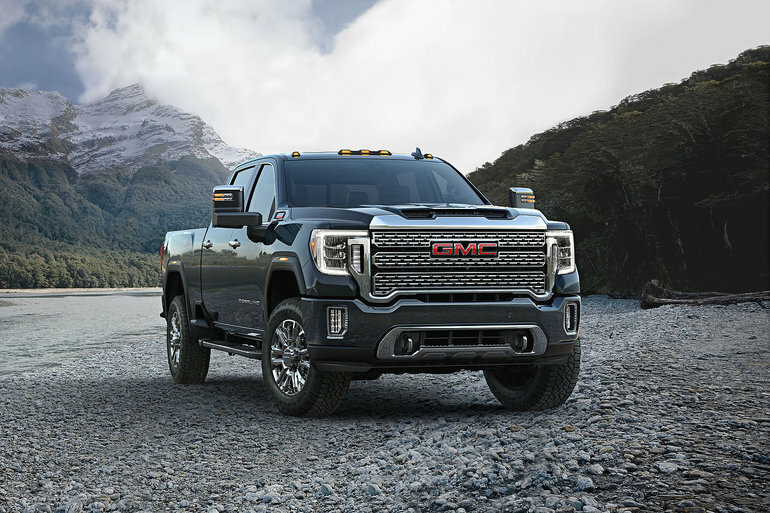 The 2020 GMC Sierra HD has been completely redesigned for 2020 and gets a wide range of improvements that include new technologies, a more rugged design and improved performance. The new 2020 GMC Sierra Heavy Duty gets most of the improvements made to the 2019 GMC Sierra 1500 including the new Multipro Tailgate with multiple positions, the ProGrade Trailering System that helps to tow, and a 15-camera system for perfect visibility around your GMC Sierra Heavy Duty. One of these cameras allows the driver to see behind the trailer as if it were invisible. It’s a unique and very useful function that will certainly help when maneuvering with a trailer at low speeds in tight spaces. Under the hood, the 2020 GMC Sierra HD which should arrive late summer 2019 will get an available 6.6-liter Duramax Turbo Diesel V8 engine with 445 horsepower and 910 pound-feet of torque. Towing is rated at over 30,000 pounds. New for the 2020 model-year GMC Siera HD is a 10-speed Allison automatic gearbox which optimizes the engine to function at the optimal range at all times and whatever you’re doing. To learn more about GMC’s impressive lineup of rugged 1500, 2500HD and 3500HD Sierra pickups, contact us today at Surgenor Barrhaven.